What happens when authorities have a change of heart half way through a project? In this case they changed the plan well enough to keep consistent architecture, thankfully. Stade Gaston-Gérard isn’t a stadium with intimidating football history. In fact, there was relatively little success and Dijon is still famous for its mustard more than a strong Ligue 1 side and the stadium for athletics rather than the world’s most popular sport. But in 2006 a stunning vision came from Atelier Michel Remon, showing 22,000 seats under one roof, first time ever in a football-only mode. Keep in mind, this was the very beginning of the latest wave in stadium design, so seeing Dijon as France’s avant-garde was equally unlikely and impressive. And the entire stadium was to be built in two phases, priced at a moderate €58.3 million. 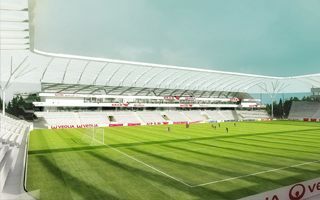 Dividing it into phases gave the chance for Dijon FCO to keep playing home games while construction was proceeding, while the municipality had more time to secure funding. But it also meant that there is a risk of not carrying the redevelopment all the way, which is what happened in 2010. When both end zones were already standing, each with around 5,400 seats (and skyboxes, which isn’t a regular feature for end stands), the project came to a stop. At that point finishing it within the previously planned budget would have been impossible already, while the two smaller stands consumed €21.7 million. The city was in difficult financial position as crisis came internationally. Also, the idea of what a stadium should provide has shifted towards revenue and sustainability rather than capacity. This is why alterations were done to the scheme. First of all, the stadium should become fully equipped even with only three new stands, not all four. This cost-cutting measure means a fourth stand is possible, but not crucial to meet national and UEFA regulations. In this aspect the Dijon situation is similar to that in Zabrze, Poland, where authorities also decided to improve the three stands they could afford rather than take a leap and build the optional last one. While club offices are usually located in the west grandstand, in Dijon they were shifted to the east one. A new design was created this year, also envisaging commercial spaces for rent opened towards the Rue du Stade (below). The new east side will be noticably smaller than planned initially. Without corner sections it will hold 5,112 people, less than shorter end stands. It needs to have a different structure too, because three floors of space for various uses needed to be created. However, it will retain a very similar, almost identical roof design to the two stands already existing. This way the stadium will keep some consistency in terms of appearance and will allow filling the corners in the future to enclose the stadium bowl at least partly. The new east stand will get under construction in May 2015 and be ready for opening within 2 years. At a cost of €18.27m it will allow Dijon to play games even in Ligue 1 and European competitions, while saving the municipality a third of the initial budget. This may not be a long-term solution, but with stadium lifespan becoming shorter than ever, it may as well last until the next major revamp is required, because there are no known plans for a fourth stand at this point.